Penalty cards are used in many sports as a means of warning, reprimanding or penalising a player, coach or team official. Penalty cards are most commonly used by referees or umpires to indicate that a player has committed an offense. The official will hold the card above his or her head while looking or pointing towards the player that has committed the offence. This action makes the decision clear to all players, as well as spectators and other officials in a manner that is language-neutral. The colour or shape of the card used by the official indicates the type or seriousness of the offence and the level of punishment that is to be applied. Yellow and red cards are the most common, typically indicating, respectively, cautions and dismissals. The idea of using language-neutral coloured cards to communicate a referee's intentions originated in association football, with English referee Ken Aston. Aston had been appointed to the FIFA Referees' Committee and was responsible for all referees at the 1966 FIFA World Cup. In the quarter-finals, England met Argentina at the Wembley Stadium. After the match, newspaper reports stated that referee Rudolf Kreitlein had cautioned Englishmen Bobby and Jack Charlton, as well as sending off Argentinian Antonio Rattín. The referee had not made his decision clear during the game, and England manager Alf Ramsey approached FIFA representative for post-match clarification. This incident started Aston thinking about ways to make a referee's decisions clearer to both players and spectators. Aston realised that a colour-coding scheme based on the same principle as used on traffic lights (yellow – stop if safe to do so, red – stop) would transcend language barriers and make it clear that a player had been cautioned or expelled. As a result, yellow cards to indicate a caution and red cards to indicate an expulsion were used for the first time in the 1970 FIFA World Cup in Mexico. The use of penalty cards has since been adopted and expanded by several sporting codes, with each sport adapting the idea to its specific set of rules or laws. Association football: A yellow card is shown by the referee to indicate that a player has been officially cautioned. The player's details are then recorded by the referee in a small notebook; hence a caution is also known as a "booking". A player who has been cautioned may continue playing in the game; however, a player who receives a second caution in a match is sent off (shown the yellow card again, and then a red card), meaning that he must leave the field immediately and take no further part in the game. The player may not be replaced by a substitute. Law 12 of the Laws of the Game (which are set by the International Football Association Board and used by FIFA) lists the types of offences and misconduct that may result in a caution or is cautionary. It also states that "only a player, substitute or substituted player" can be cautioned. In most tournaments, the accumulation of a certain number of yellow cards over several matches results in disqualification of the offending player for a certain number of subsequent matches, the exact number of cards and matches varying by jurisdiction. Athletics: In track events, a yellow card is as a personal warning in both track and field events used to indicate that a second yellow card would result in a disqualification. IAAF rules have abolished false start warnings; false starts now result in immediate disqualification except in combined events where a diagonal yellow/black card indicates a warning for false start. However, as of 2012, the false start rule is that an athlete's hands must leave the track or their feet must leave the starting blocks before the gunshot in order for a false start to be given. Therefore, if an athlete makes a twitch, while being in their final 'set' position, the maximum penalty is a yellow card. Australian rules football: A yellow card is issued against a player for committing any reportable offence (such as striking an opponent, swearing at an official, amongst others), except those listed as 'serious' reportable offences. Any player issued a yellow card is unable to participate in the game for the length of a quarter of play, excluding breaks, although the player can be replaced. However, a yellow card may be issued against a player at the discretion of an umpire, despite the player not committing a reportable offence. Yellow cards and red cards are, however, not issued in the Australian Football League, the highest level of play in Australian rules football. Badminton: A yellow card is given to a singles player or doubles pair as a warning for breaching the Laws of Badminton. A yellow card can only be given once to a player or pair in a match, subsequent breaches are sanctioned with a red or black card. Bandy: A yellow card indicates a warning given to an entire team for technical fouls such as errors in the execution of goal-throws or free strokes, or the obstruction of a player without ball. Subsequent technical fouls by the same team result in a five-minute penalty indicated by a white card. Canoe polo: A yellow card indicates a player has received a two-minute temporary suspension. A yellow card can be awarded for a deliberate or dangerous foul that prevents the scoring of a near certain goal, dangerous illegal play that is deliberate or repeated, foul or abusive language, continuously disputing a referee's decisions or receiving a third green card for any reason. Equestrian sports: Yellow cards may be issued during FEI sanctioned events for abuse of a horse or incorrect behavior towards an official. Abuse of the horse may include riding an obviously lame horse, riding an exhausted horse, excessive use of whip or spurs, and dangerous riding. Riders may choose not to accept issued cards, but doing so may lead to a disciplinary hearing. A rider receiving a yellow card can be disqualified from the event and subsequently fined or suspended. Fencing: A yellow card indicates a warning to a fencer and is valid for the remainder of the bout. In some cases, an annulment of any hit scored by the fencer at fault may also occur. Yellow cards are awarded for "Tier 1" offenses, such as turning your back to your opponent, covering target area (most common in Foil), leaving the piste without permission, or refusing to obey the referee. A yellow card can also be awarded when, at the first call by the referee, a fencer does not present himself on the piste ready to fence. Any person not on the piste who disturbs the good order of the competition may also receive a yellow card on the first infringement. Field hockey: A yellow card indicates a temporary suspension of at least 5 minutes. The length of the suspension is determined by the umpire. It is possible for a player to receive two yellow cards for different offences during the same match; however, the period of suspension must be significantly longer with each yellow card. When an offence for which a yellow card has been awarded is repeated, the yellow card must not be used again and a more severe penalty must be awarded. There must also be a clear difference between the duration of a yellow card suspension for a minor offence and the duration for a major offence. The yellow card can be shown to a specific player or to the captain for misconduct by the entire team. In this case, the captain is temporarily suspended. Gaelic games: In camogie, Gaelic football, hurling and ladies' Gaelic football a yellow card (Irish: cárta buí) is given to players for moderate fouls. A player who receives two yellow cards in a single game is sent off and receives a red card. Handball: A yellow card indicates a warning and can be given to a player or team official for unsportsmanlike conduct, or to a player whose actions are mainly or exclusively directed at the opponent and not at the ball. IHF rules also allow referees to use discretion to award a yellow card outside of these situations. Mixed martial arts promotions PRIDE (defunct), DEEP, and ZST: A warning, the third leads to disqualification. Racewalking: A yellow card indicates a competitor's foot fails to be on the ground when the rear leg is being raised, or the front leg is not straightened when it makes contact with the ground. Rugby league: Yellow cards are not usually used in rugby league in the southern hemisphere with referees indicating a 10-minute suspension by raising both arms straight out with fingers spread (to indicate 10 minutes). This is otherwise known as a "sin bin". However, in the northern hemisphere it is common for a referee to use a yellow card in signaling a "sin bin" to indicate 10 minutes instead of using the arm and hand signal used in the southern hemisphere. It is possible for a player to receive seven yellow cards without receiving a red card (a player who receives eight yellow cards in a match will receive a red card, which results in ejection from the match). However, it is up to the referee's discretion at how bad the offences are, and in these cases, a red card may be commonly shown for a second major offence without the presence of a second yellow card. Rugby sevens: Any player who commits an offence under World Rugby Law 9 – Foul Play may be shown a yellow card and suspended from the game for 2 minutes without replacement. Offences include obstruction, unfair play, repeated infringements, dangerous play and misconduct which is prejudicial to the game. Receiving a yellow card is known colloquially as being sent to the "sin bin". If that player later commits another yellow-card offence, the player will be shown a red card (see below) and be sent-off. Rugby union: Under World Rugby Laws, any player who commits an offence under Law 9 – Foul Play may be shown a yellow card and suspended from the game for 10 minutes; the player cannot be replaced during that time. Offences include obstruction, unfair play, repeated infringements, dangerous play and misconduct which is prejudicial to the game. Receiving a yellow card is known colloquially as being sent to the "sin bin". A player receiving a second yellow card in a game will also be shown a red card (see below) meaning that he or she has been sent-off and will be unable to take part in the remainder of the match. Volleyball: Under FIVB rules a yellow card is the second stage of a formal warning for a player(s)/coach for minor misconduct, the first being a verbal one given through the team captain. It is recorded on the scoresheet but has no immediate consequences - there is no loss of service (if applicable) and no point awarded to the opposition. It is shown together with a red card (in one hand) where a player(s)/coach is sanctioned with expulsion, and (with a card in each hand) separately with a red card where a player(s)/coach is sanctioned with disqualification, all such offences are recorded on the scoresheet. Water polo: Given as an official warning for disrespectful conduct from the coach, individual players, or the entire bench. A red card is used in several sports and most commonly indicates a serious offense and can often mean that a player has been removed from the game and may be barred from the next game as well. Association football: A red card is shown by a referee to signify that a player has been sent off. A player who has been sent off is required to leave the field of play immediately and must take no further part in the game. The player who has been sent off cannot be replaced during the game; his team must continue the game with one player fewer. Only players, substitutes and substituted players may receive a red card. If a goalkeeper receives a red card another player will be allowed to assume goalkeeping duties (teams will usually substitute an outfield player for another goalkeeper if this option is available). A red card will be shown to a player who has committed a serious offense such as violent conduct or an illegal and purposeful obstruction of a goal scoring opportunity for the opposing team. A red card will also be shown to a player who accumulates two yellow cards for more minor offenses. For more details, see Red card (association football). Athletics: A red card indicates that the athlete is disqualified after receiving 2 yellow cards. A diagonal red/black card is issued if a false start has been made. Australian rules football: A red card is issued against a player who has accumulated two yellow cards over the course of a match, or has committed a 'serious reportable offence' (such as striking an umpire or kicking an opponent). A player issued with a red card may not participate for the remainder of the match; however, unlike most sports, the player can be replaced, although not until a length of time equivalent to one-quarter (excluding breaks) has elapsed. Yellow cards and red cards are, however, not issued in the Australian Football League, the highest level of play in Australian rules football. Badminton: A red card is given to a singles player or doubles pair to penalize subsequent infractions after receiving a yellow card. It counts as fault, meaning the opposing side is awarded a point. After a second red card, a player or pair may be disqualified with a black card at the tournament referee's discretion. Bandy: A red card indicates a match penalty, i.e. a player has been excluded for the remainder of the match and cannot be substituted. Red card offenses include directly attacking an opponent or using abusive language. A coach or substitute may also be penalized with a red card. In this situation, a player currently on the rink also serves a ten-minute penalty, resulting in the number of players being reduced by one. Canoe polo: A red card indicates a player has been sent off for the remainder of the match and cannot be substituted. A red card can be awarded if a personal attack on a player occurs, repeated foul or abusive language, or when the award of a yellow card is disputed or has not had the desired effect of causing the player to control his play or attitude. A red card is also awarded when a player has received a second yellow card for any reason. Cricket: In December 2016, it was announced that by October 2017 cricket umpires would be given the power to issue red cards to send off players who have committed the following: “threatening an umpire; physically assaulting another player, umpire, official or spectator; or any other act of violence”. Fencing: A red card is used to indicate that a fencer has committed an offence that warrants a penalty hit to be awarded to the opponent. Second and subsequent Group 1 offences, all Group 2 offences and first Group 3 offences are penalised with a red card. A red card may also be awarded when, at the second call by the referee, a fencer does not present himself on the piste ready to fence. Field hockey: A red card results in a player being permanently suspended from the game. The player cannot take any further part in the game and cannot be substituted. Unlike other penalty cards in field hockey, the red card is never given to the captain for team misconduct. In addition to their colour, red cards in field hockey are often circular in shape. Floorball: A red card is results in the player being ejected from the game and his/her team being penalised with a 5-minute bench penalty. In floorball, the red card can be linked with 3 different types of Match Penalties (MP 1, 2 and 3). MP1 is linked with violent play during the game, such as heavy hits (pushing) against the goal-cage or boarding; this penalty does not cause additional suspension in the tournament. MP2 is linked with offences such as sabotage of the game, mild brawl (no punches), and is also given when a player receives his/her second 5-minute bench penalty; this match penalty causes an automatic 1-game suspension. MP3 is linked with vulgar conduct, such as insulting the referee, another player or spectators, violent conduct that is not directly linked with play (such as punching an opponent); this match penalty causes an automatic 1-game suspension, and is further reviewed by a disciplinary committee that can penalise the player with additional suspension. Gaelic games: In camogie, Gaelic football, hurling and ladies' Gaelic football a red card (Irish: cárta dearg) is given to players for serious fouls and violent conduct. A player who receives two yellow cards in a single game is sent off and receives a red card. Handball: A red card indicates a disqualification of a player who has committed an offense such as unsportsmanlike conduct, serious foul play, or receiving a third two-minute suspension. A red card prevents a player from playing for the remainder of the match and as a result reduces the number of players that are available to a team. A red card also carries a two-minute suspension for the team, meaning that a team cannot replace the disqualified player until the two-minute team suspension has expired. Racewalking: A red card indicates that a competitor's foot failed to be on the ground when the rear leg is being raised or that his front leg is not straightened when it makes contact with the ground. A judge would issue a yellow card for the first infraction committed by a competitor. And if the same judge detects the second infraction from the same competitor, a red card is issued. Three red cards, from three different judges, will result in a competitor's disqualification. Rugby league: Red cards are not usually used in rugby league in the southern hemisphere with referees indicating a player has been sent from the field for the rest of the match with one extended arm above the head with the index finger pointed in the direction of a sideline. However, in the northern hemisphere, it is common for a referee to use a red card in signaling a player has been sent from the field for the rest of the match, with no replacement allowed. It is possible for a player to receive seven yellow cards without receiving a red card (a player who receives eight yellow cards in a match will receive a red card, which results in ejection from the match). However, it is up to the referee's discretion at how bad the offenses are, and in these cases, a red card may be commonly shown for a second major offense without the presence of a second yellow card. Rugby union: A red card is used to indicate that a player has been sent off and can take no further part in the game. He cannot be replaced, leaving his team with one fewer player for the remainder of the game. During international matches, a player who commits an offense under Law 9 – Foul Play may be shown a red card. Red cards are normally issued for serious offenses. Any player receiving a second yellow card in a game will automatically be shown a red card. Volleyball: A red card can be issued by the referee for the first instance of Rude Conduct. It is recorded on the scoresheet and results in loss of service (if applicable) and a penalty point to the opposition. Rude Conduct is the only category of sanction punished by a Red card alone, and which results in loss of service (if applicable) and a penalty point. For the sanctions of Expulsion and Disqualification, a Red and Yellow card is shown simultaneously, held together in one hand, or separately in each hand, respectively. Two Man (beach): The rules vary in one aspect from the six-a-side competition. A red card is shown for the first and any second offense of Rude Conduct in the same set. It is recorded on the scoresheet, resulting in loss of service (if applicable) and a penalty point to the opposition. Otherwise the procedural use of cards is the same as for six-a-side. Water polo: A red card is issued to a coach or player on the bench for a second incident of misconduct after receiving a yellow card or severe unsporting conduct. A person receiving a red card must leave the competition area. In field hockey, a triangular-shaped green card indicates a 2-minute suspension for field players and a warning for a coach. A Penn State field hockey player receives a green card. 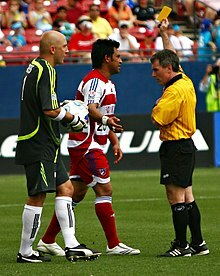 A green card is used in some sports to indicate an official warning to a player who has committed a minor offence that does not warrant a more serious sanction. Athletics: A green card indicates that the recall did not warrant a warning, which most commonly happens when the machines used to catch false-starters make a mistake. Canoe polo: A green card indicates an official warning that can be applied to an individual player or a whole team. A green card can be awarded for deliberate unsporting behavior or unnecessary verbal communication to the referee. Field hockey: A green card indicates an official warning when a minor offence has occurred. A second green card for the same player will result in a yellow card (5 minute suspension). In this case, the umpire will show a green card, followed by a yellow card. When an offence for which a green card has been awarded is repeated, a yellow card should be awarded. A green card can be given to a specific player or to the captain as a warning to the entire team. Cards shown to the captain as a warning to the team are treated separate from cards shown to the captain as a player. In addition to their colour, green cards in field hockey are triangular in shape. Under FIH Rules of Hockey, the green card carries a two-minute suspension during which time that player's team plays with one fewer player. Association football: A few minor leagues use a green card as an indication of commendable conduct. In bandy, a white card indicates a five-minute penalty while a blue card indicates a ten-minute penalty. A white card is used in bandy to indicate a five-minute timed penalty given to a player. The offending player must leave the playing area and wait on a penalty bench near the centre line until the penalty has expired. During the 5 minute period the player may not be replaced, although he or she may be replaced with a different player when the penalty has expired. Offences that can warrant a white card include trying to hinder the opponents from executing a free-stroke, illegal substitution or repeated illegal but non-violent attacks on an opponent. In the 2012 Super Rugby season in rugby union, a White Card was introduced for incidents of suspected foul play where the referee is unsure of the identity of the perpetrator, or where the referee is unsure if a red card is warranted. The incident is later referred to the citing commissioner, and may result in a suspension for the offending player. It is similar to a citation sign (arms crossed above the head) in rugby league. However, in 2013 the International Rugby Board, now known as World Rugby, extended the powers of the TMO to include reviewing suspected incidents of foul play. As a result, no white cards were issued in 2013. A blue card or 'Blue Disk' as pioneered by The Elms, is used in bandy to indicate a ten-minute timed penalty given to a player. The offending player must leave the playing area and wait on a penalty bench near the centre line until the penalty has expired. During the 10 minute period the player may not be replaced, although he or she may be replaced with a different player when the penalty has expired. A blue card is typically shown for offences that are more serious than those warranting a white card including attacking an opponent in a violent or dangerous way, causing advantage by intentionally stopping the ball with a high stick or protesting a referee's decision. A blue card is also frequently used in indoor soccer in the United States, signifying that the offender must leave the field and stay in a penalty box (usually 2–5 minutes), during which time their team plays down a man (identical to ice hockey and roller hockey). If a goal is scored by the team opposite of the offender, then the offender may return to the field immediately. It is also used in the Clericus Cup association football league for a 5-minute bench penalty for unsportsmanlike play. And it is also used in the beach soccer for a 2-minute bench penalty for unsportsmanlike play. A Blue Card is also used in quidditch to indicate a technical foul. The fouling player is sent to the penalty box for one minute or until a goal is scored against the fouling player's team. Unlike a yellow card, there is no additional penalty for multiple blue cards. In European indoor soccer or Futsal, a Blue Card was used to send a player off the court; however the team was able to replace him with another player. The offending player could not return to play during the match. A blue card was shown directly for foul play or verbal abuse, if the same player had received two yellow cards, or if he had accumulated a total of 5 fouls during the game. The Blue Card has been in use in Handball since the International Handball Federation announced a rule change that came into effect on July 1, 2016. First the Red Card is shown, then the referee will after a short discussion show the blue card. Following that a written report will accompany the score sheet and the Disciplinary Commission will then decide on further actions against the player. A black card is used in fencing. It is issued by the director, or the referee for severe rule infractions. A second instance of a Group 3 offence, and all Group 4 offences including deliberate brutality, refusal to fence, refusal to salute, and refusal to shake hands can be punished with a black card. When the black card is issued, the offending fencer is excluded from the remainder of the competition and may be suspended from further tournaments. In the official record of the tournament, his or her name is replaced with the words "FENCER EXCLUDED". A black card is also used in the sport of badminton to indicate disqualification. In the Gaelic Games of Gaelic football and hurling, a tick or black book – was formerly recorded against a player for a minor infringement not warranting a yellow card, though multiple bookings will result in the issuance of a yellow card. The act of the referee physically holding up his black notebook in the same manner as a card has been discontinued by the GAA. Beginning January 1, 2014 a player in Gaelic football can be ordered off the pitch for the remainder of the game with a substitution allowed by being physically shown a Black Card (the referee's black notebook) in the same manner as any other penalty card for "cynical behaviour," including blatant tripping, pulling down and bodychecking. This forced substitution is an intermediate punishment between the yellow and red cards. A player who receives a yellow card and a black card in the same game is sent off without any substitute being permitted. ^ a b "Ken Aston – the inventor of yellow and red cards". fifa.com. Retrieved February 20, 2013. ^ a b c "Laws of the Game". fifa.com. Retrieved June 6, 2008. ^ a b c "IAAF Starting Guidelines" (PDF). ^ "IAAF sanctions immediate disqualification for false starts come January". The Daily Telegraph. London. August 12, 2009. Retrieved August 25, 2015. ^ a b "AFL Laws of the Game" (PDF). AFL Commission. Archived from the original (PDF) on May 22, 2012. Retrieved October 20, 2012. ^ a b "Laws of badminton". bwfbadminton.org. Badminton World Federation. pp. 10–11. Retrieved 1 March 2015. ^ a b "Recommendations to technical officials". bwfbadminton.org. Badminton World Federation. pp. 8–9. Retrieved 1 March 2015. ^ a b c d "Bandy – Rules of Play". internationalbandy.com. Retrieved June 10, 2008. ^ a b c "International Canoe Polo – Rules of Play". canoepolonz.org.nz. Archived from the original on October 14, 2008. Retrieved June 12, 2008. ^ a b "FEI General Regulations" (PDF). fei.org. Archived from the original (PDF) on July 4, 2008. Retrieved September 17, 2008. ^ a b c d e f "FIE Competition Rules". britishfencing.com. Retrieved Sep 8, 2010. ^ a b c d "Rules of Hockey" (PDF). FIH. Retrieved November 16, 2016. ^ a b c "International Handball Federation – Rules of the Game 2005". ihf.info. Retrieved June 8, 2008. ^ a b Mike Rosenbaum. "Olympic Race Walking Basics". About.com Sports. ^ "Law 9 – Foul Play (Sevens Variation)". Laws of the Game: Rugby Union. World Rugby. Retrieved 21 March 2018. ^ a b "Law 9 – Foul Play". Laws of the Game: Rugby Union. World Rugby. Retrieved 21 March 2018. ^ "MCC recommends sendings off be introduced into laws of cricket". The Guardian. 7 December 2016. Retrieved 7 December 2016. ^ "¿Qué es la tarjeta verde? (What is the green card?)". RFEF. ^ "La Serie B e la novità del 'cartellino verde'(The Serie B and the novelty of the 'green card')". ^ "Super Rugby: White card set for Super Rugby bow - Live Rugby News - ESPN Scrum". ESPN scrum. ^ "Rugby365 - New TMO protocol". rugby365.com. ^ "Rennie apologises for bizarre semi incident". Stuff. ^ "IHF Announces Rule Changes Effective July 1st 2016 : Irish Olympic Handball Association". www.olympichandball.org. ^ "Fencing For Parents". U.S. Fencing – The Official Website of the U.S. Fencing Association. Archived from the original on 2008-06-25. Retrieved 2008-08-14. ^ "8 badminton players tossed from Olympic doubles after being accused of throwing matches". New York Post. Associated Press. 1 August 2012. Retrieved August 1, 2012. ^ Keys, Colm (May 8, 2009). "GAA throw caution to wind and abandon black books". Irish Independent. ^ "GAA passcontroversial 'black card' rule". Irish Independent. 23 March 2013. Retrieved 14 August 2013.